Some meetings require more than a basic room, a standard meeting venue just won't cut it, they need a creative and stimulating environment. 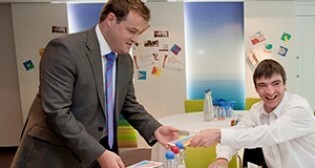 Crowne Plaza Marlow’s new and innovative Creative Meeting Space provides a fresh take on traditional meetings. Too much silence in the room? The Crowne Plaza Ideas Store will provide you with suggestions to engage and inspire your attendees and expand the way that they think. Included in the Ideas Store are a range of tools and inspiring books to drive your meeting forward and stimulate creativity. Furniture designed to facilitate brainstorming in an interactive, collaborative way. Multiple seating options to choose from based upon the size and objective of your meeting. High energy ‘brain foods’ have been incorporated into a speciality EatWell.WorkWell menu, designed to keep meeting attendees alert and focused throughout the day. You may just want an impromptu, casual get together or to meet in a more relaxed environment. Thanks to our Lobby Connect Lounge, you can. Stylish furniture, lots of places to plug in your laptop, great internet access and our specially devised EatWell.WorkWell. menu, perfect for meeting and eating, makes the Lobby Connect Lounge the perfect Place to Meet.